Step2 has always had a history of innovation during its nearly 30 years in business, from developing the first “all-in-one” resin mailbox to creating entirely new toy categories including kids’ roller coasters. But it was still a bit of a surprise to learn that Step2 products would appear on Shark Tank, a show known more for exposing new companies and their ideas instead of well established organizations like Step2. Here’s how it all happened. A couple of years ago, the innovative minds at Step2 recognized that protecting package deliveries was going to be an important priority for consumers given the rapid growth of online shopping. (Thanks, Amazon and others!) As individual package delivery frequency increased, the threat of porch piracy emerged as did additional concerns about protecting deliveries from weather. Given Step2’s strong mailbox legacy, the company decided to launch a series of products designed to protect package deliveries, and the Step2 Express Package Delivery Box was born in 2017. Initial reaction to the concept of protecting package deliveries was very favorable, and additional consumer insights led to the decision to create a new version of the delivery box that homeowners could lock. But no ordinary padlock would do. The challenge became finding a lock that multiple delivery drivers could easily use during the course of the day and one that could alert the homeowner when a package was delivered. Fortunately, a company called BoxLock had just the solution: the first smart delivery padlock. Step2 didn’t need to invent the technology; BoxLock had already created the perfect complement to Step2’s package delivery boxes. Step2 created a new product, the Deluxe Package Delivery Box, with a hinged lid and a latch that was compatible with BoxLock so consumers could enjoy the ultimate in delivery protection. Since then, BoxLock has received a lot of attention and favorable press. 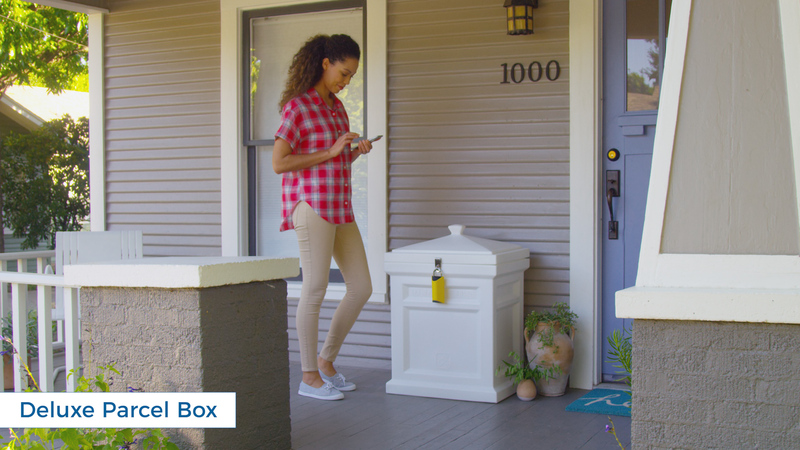 When the hit ABC Series Shark Tank came calling, BoxLock was eager to share its technology and chose to use the Step2 Deluxe Package Delivery Box to best showcase the unique advantages of its smart delivery padlock on the show. And it’s not just security that Step2 provides. Step2’s Deluxe Package Delivery Box also features durable resin construction, never requires painting and matches a variety of home styles. It’s also available in a number of attractive colors including Estate White, Manor Gray, Elegant Black and Rich Mocha. Be sure to watch Shark Tank on ABC Sunday, October 7 at 10:00pm eastern time to see BoxLock and the Step2 Deluxe Package Delivery Box!